My great-grandfather was born in Cressy, Northern Tasmania on 14 May 1863 . His parents were Henry (Harry) John Ewart and Ann Manahan. I don't have information about John until he married Johanna in 1887 in Hobart. One interesting fact that I found in 2009 was that in his later years while living in Ross (Midlands, Tas), John would dress in his best suit on Sunday and walk to and from Cressy where he visited the grave of his mother Ann. This story was helpful as it established that the Ann Ewart I found in the Cressy cemetery was indeed John's mother. Thank you to Ann's great grandaughter Janice for providing a photo of the gravestone and substantiating the fact that Ann is indeed John's mother. My great-grandfather John was a farmer in the Lower Midlands area of Tasmania when he married Johanna Grieve (nee MacCauliffe) on 10th September 1887 in a house at 15 Williamson St., Hobart. The witnesses at the wedding were Ted McAuliffe and Margaret Newlove (nee McAuliffe, Johanna's sister). They were both aged above 21. Johanna had previously been married to John Grieve (21st Dec, 1880 in Hobart). They had three children (John, Mary & Bridget) before John died on 11 October 1885 in Hobart, aged only 41. John & Johanna Ewart had three children together, the youngest being my grandfather Harold Henry born in Dec 1892 (no record found). It seems safe to assume that he was named after John's father Henry who was sometimes called Harry. One girl had been born earlier, Isabella Louisa in 1889 and then Annie Venetia Myrtle in 1892. Annie only lived to age 4, she died in Hobart in 1896. In 1908 John who was already a father or stepfather to 6 children married a widow called Georgina Dare (nee Saunders). Georgina had five children with her husband Arthur Dare who died in March 1889. They were Mercedes (1890), Linda (1892), Lorice (1894), Arthur (1895) and Herbert (1897). So John's family now had increased to 11 children! The interesting part of this particular story is that John declared himself a bachelor (no wife and no children recorded) when he married in 1908. Why would he do this I have to ask? I have been unable to find any trace of Johanna, her 3 children to John Grieve (John, Bridget and Mary Grieve) and her surviving daughter to John, called Isobel. 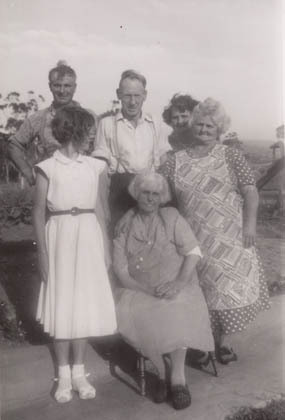 John and Georgina had another 3 children together (Hazel (1908), John (1914)and Don (1919). All together John then had become father and stepfather to 14 children and yet his granddaughter Margaret Ewart did not know any of her father Harold's family! Georgina died at the age of 81 on the 1st June 1956 and is buried at Carr Villa Cemetery in Launceston beside her daughter Hazel (Simpson). I found some of these by searching the electoral rolls and others have come from marriage certificates. In 2009 I was contacted by Hannah in Launceston who believed we had a Ewart connection and later that year I visited with her and her grandmother Tasma. This was a wonderful occasion as Tasma was able to relate to me some stories about my great grandfather John Peter Ewart as he had been her father-in-law. I was able to fill them in on the mystery surrounding John's earlier family which included my grandad Harold. Although Tasma had not actually met John she told me of the stories her husband Don had related about his father. "He was a quiet, softly spoken man who was well regarded by his family". The funeral of Mr John Peter Ewart took place on Wednesday at the Church of England cemetery, Ross. A service was conducted by the Rev. G. Clarke at St. John's Church. Mr Ewart had a seizure on Sunday and was taken to the Campbell Town Hospital, where he died on Monday. Born at Cressy 78 years ago, he was a resident of Ross for the past 24 years. He is survived by his wife, five sons, Jack, Donald, Arthur, Harry and Herbert; and five daughters, Hazel (Mrs J Simpson), Elvie (Mrs H Challenger), Clara (Mrs Price), Laura (Mrs W Barsley) and Linda (Mrs Kean). Chief mourners were Messrs Donald and Harry Ewart and Mr J Simpson (son in law). Funeral arrangements were carried out by Messrs W Lockett and Sons Campbell Town. I searched the Ross Cemetery but could find no gravestone or marker of any kind for John. However in 2014 I was contacted by Hazel Simpson's daughter Janice to say that she and her husband have organised a memorial plaque and it is now against the northern wall of the convict built wall.